USS Arizona Memorial: Still the #1 Hawaii Attraction. 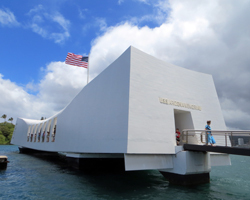 The USS Arizona Memorial Remembers Fallen Heroes! As far as I know, the sunken battleship USS Arizona Memorial Pearl Harbor is still the #1 visitor attraction in Hawaii – free or otherwise – thus proving that December 7, 1941 continues to be a day living in infamy. Though it happened more than 70 years ago, the sneak attack on Pearl Harbor is still noteworthy and notorious as the United States’ explosive entry to World War II (WWII). Furthermore, it literally changed the course of humankind’s history. In this current age of historical revisionism, I think it’s simply outstanding to have a tangible reminder of both the men who died and what they gave their lives to protect. That’s why you need to see this Hawaii attraction at least once in your lifetime. You can now make online reservations for the USS Arizona Memorial (link opens a new window/tab). It will cost you $1.50 convenience fee, which is absolutely worth the guaranteed reservation and the time you’ll save. By all means, eliminate some hassle and get your tickets in advance. 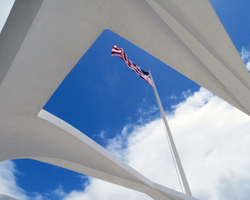 Better still, unlike many other national parks, admission to the USS Arizona Memorial is free. Parking is also free (a rarity in Hawaii). Immediately after you arrive, go directly to the ticket desk and obtain your free tickets (unless you already made your reservation online). Tour tickets display the exact time that you’ll start your tour; and these tickets are awarded on a first-come-first-served basis. Tours typically start at 8am, and a new group enters the theater every 30 minutes. Fortunately, the ticketing system means you don’t have to stand in line. You just have to gather outside the theater a few minutes before your ticketed tour time. But don’t miss that scheduled tour, because they probably won’t have room for you with any of the later groups. When my family completed our tour at noon, I overheard that there were no more tour tickets available for the rest of the day. I think this is fairly common, so make sure you arrive early (or make reservations online). You’re not allowed to bring bags into the historic park area (Moms: that includes purses and diaper bags). So you’ll have to check your bag for a $3 locker fee or leave it in the car – which posted signs in the parking lot recommend against due to potential theft. In July 2012, my family arrived at the ticket window inside the park at 8:30am, and we were given tickets for an 11am USS Arizona Memorial tour. So for the next 2.5 hours, we took a self-guided tour of the surrounding exhibits and memorabilia (you can also rent an audio tour). There’s plenty to keep you busy until your tour starts. We easily filled our wait by taking photos of my 8 and 10-year-old children playing around the various hands-on exhibits (torpedoes, missiles, anti-aircraft guns, submarine periscopes, a section of the interior of a submarine, etc). Then we spent the rest of our wait time browsing the two gift shops and touring one of the two free museums. When we became thirsty, we were pleasantly surprised to discover that the snack shop is more reasonably-priced than a movie theater. 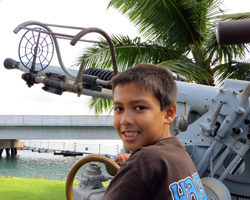 You can also pay ($10/adult & $4/child) for a tour of the WWII submarine USS Bowfin, which we did not do. 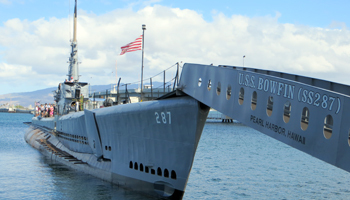 If you’re interested in seeing all the historic Hawaii attractions in this area, you might want to consider booking one of the paid Pearl Harbor Tours - CLICK HERE! (Link opens a new window/tab). Or if you prefer the convenience and value of city passes, you might want to consider the Go Oahu Card: Shop now and save up to 55% off Oahu's top tours and attractions! This card would give you access to a narrated tour of the Arizona Memorial, a tour of the USS Bowfin Submarine, a tour of the USS Missouri battleship, entry to the Pacific Aviation Museum, and dozens of other Oahu attractions for one inclusive price (link opens a new window/tab). When the ranger asks for your attention, he means it! Each group is comprised of approximately 150 people, and there was one woman in our group who just would not shut up! The ranger literally separated her from her family to get her to stop talking. When it’s time for your tour, you will cluster outside the theater where the tour begins so that a park ranger can explain how the tour will proceed… Basically, every tour begins with a 23-minute film showing actual footage of events leading up to and during the attack on Pearl Harbor. The film is quite good but possibly a little intense for young children. Then when it’s over, everybody rides a small harbor ferry out to the actual memorial, which is built above the sunken wreck of the battleship Arizona. The ride is smooth and brief. I can’t imagine conditions are ever such that you would need to worry about seasickness. Once you get to the memorial, you’re free to look around and pay your respects for the amount of time it takes to ferry the previous tour group back to the park and return with a new group. If you wish to see the Utah or Oklahoma Memorials, as well as the decommissioned battleship Missouri, those are separate Hawaii attractions located on Ford Island in the middle of Pearl Harbor. 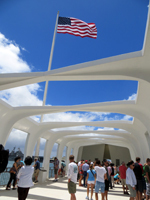 You can inquire about these tours at the USS Arizona Memorial ticket desk. Let us never forget the past, lest we run the risk of repeating it.